Home › Mummy time › Mothers, Daughters, Tea and Shopping. One recent Saturday afternoon I came across Beauty and the Beast on the Sky Disney channel. As I’d never seen the movie, it was raining outside, the stove was lit, and my husband had cooked dinner, there was little more to do than snuggle down and watch. Eva snuggled into me and we had a lovely hour or so cuddled up on the couch together. Dylan wasn’t interested at all but kept himself very well entertained building some sort of elaborate fort from sofa cushions and toy piano legs. It seems so simple, just a little time doing the same thing. Usually I can’t watch TV during the day and if the kids are absorbed in a movie, I take it as my chance to get a few jobs done without being interrupted. It made me think of what times the kids really enjoy most, what is their favourite way to spend time together and with me. When I was a child, I loved to go ‘down town’ with my mum. 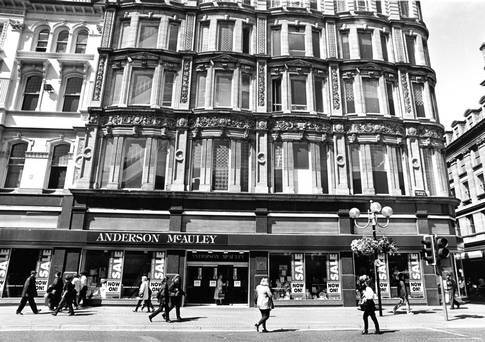 We’d always pay a visit to Anderson & McAuley’s in Belfast, a vast old-fashioned department store, spanning several floors, which later became Habitat, Monsoon, among others, and now Zara. Anderson & McAuley’s opened its doors in 1861.The large metal letters are still on the frontage, although a few have gone missing. Sometimes I think I’d like to steal the the ‘A’, but I don’t of course, because that would be wrong and mostly because my husband would go mad. This was where my parents purchased my first school bag — a red satchel with a single handle on the top, a clown on the front. And, I imagine to make the transition to school easier, my parents hid a new doll inside. Also, I recently found out my lovely aunt, who passed away last year, worked here as a pastry chef before I was born. I have memories of browsing this store with my mother as a very young child. We’d float up the escalator to arrive at the 3rd floor where we were met with the sweet, intermingling scent of coffee and pastries, the content hum of women catching up over their tea and the clinking of teaspoons in teacups. I loved this civilised and welcoming hideaway, which was far from the hustle and bustle on so many levels. The only thing I can compare it to is the level of intimacy of a hair salon you’ve been going to for years and years. Just women, chatting about superficial, silly stuff – our purchases, new clothes, whatever… As we stepped off the escalator I’d reaslise my opportunity to select a bun was imminent. Bingo when you’re only 5! If you’re from Belfast, you’ll know how fond we are of our wee buns. When we’re out shopping, the afternoon doesn’t count unless you stop for some refreshments. Even if you don’t find what you’re looking for, the day is not wasted; you can at least stop for tea, a chat and a bun. Since Anderson and McAuley’s is no longer there, we have a few, new favourite locations for tea: Bewley’s café, Avoca, and Queen’s bar in Queen’s arcade where you also enjoy something stronger on a cold day. And more recently my mum and I have discovered the Fitzwilliam Hotel on Great Victoria Street and their decadent Champagne afternoon tea (a little treat to ourselves before Mother’s day). Before our tiers of treats arrived, we were served delightful mini tea cups of parsnip soup. It was so gorgeous, I’m now searching for a good recipe – so If you have one, please let me know. We even asked for a second pot of tea as we were quite thirsty from all the shopping, as you can imagine. The staff were lovely and the restaurant provided a comfortable and genteel escape from the rush of Saturday shoppers. My daughter is old enough to trail around clothes shops with me. She tells me what she likes and what she doesn’t, often within earshot of the staff. Anderson and McCauley’s may be gone, but now the three of us will keep up the mother and daughter tradition of shopping, followed by a chat with tea and a bun. And now that we’ve developed a penchant for afternoon tea, the Merchant hotel is next on our list. I’ll let you know how we get on. Lovely memories shared here, and what a great idea to put a doll into your bag. Brilliant. Long may the circle continue. What a lovely afternoon you had. once in a blue moon I sit down and watch a film with the kids, usually Frozen or something we’ve seen a million times. it’s so great to take the time. 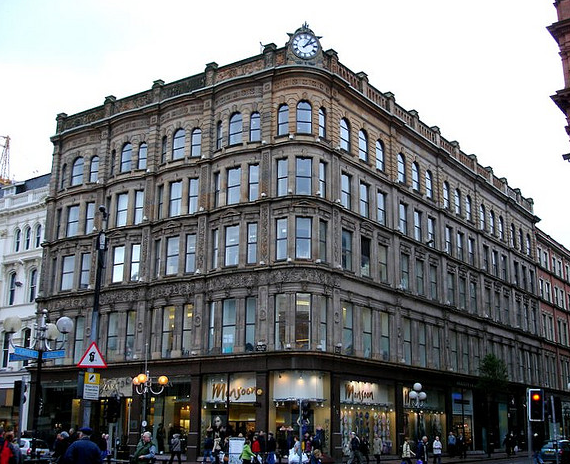 I have really strong memories of shopping in Belfast too, so strong that I actually won a competition with a Flash piece I wrote about it…. but unfortunately I hated it!!! Hated Belfast, Hated the turnstiles, hated the police and army checkpoints and I hated Andersons and McAuleys! I still hate clothes shopping. Really ?! That’s hilarious!! The turnstiles were horrible things weren’t they? They made an awful clank as you shoved through, and when you got too big, you’d have to go through on your own rather than with your mummy. And then you’d have to file passed the one-way glass. I remember staring in… It was great when they got rid of all that. I can’t wait to read your piece on Belfast! Why haven’t I seen it before? Have you been spreading the word? Your piece on Clonnard was amazing so I can’t wait to read it. Do you not love Victoria Square?? I love wandering around the makeup counters and handbags section. House of Fraser is handbag heaven. I think I like the escapism of it and the fact that you’re indoors in the warmth. I know you love the flea markets 🙂 I’ve tried a few second hand stores but can’t seem to find anything I really like. I’ve an aunt who was very stylish in her day – we’d ask her where she bought something we liked and she’d more often than not she’d say St. George’s market.